This article is about 1988 film. For 2007 Kannada film, see Police Story 2 (2007 film). Police Story 2 (Chinese: 警察故事續集, a.k.a. 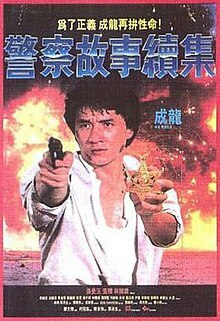 Jackie Chan's Police Story 2) is a 1988 Hong Kong action film written, directed by and starring Jackie Chan as Chan Ka-kui. It is a sequel to the hit 1985 film, Police Story, continuing the storyline of Chan's character, "Kevin" Chan Ka-kui. Inspector Chan Ka-kui has been demoted to highway patrol as the result of his handling of his previous case, which involved the violent arrest of crime lord Chu Tao and heavy property damage. The new duty pleases his girlfriend, May, who is glad that her boyfriend is no longer taking difficult cases and has more time to see her. However, the happy mood changes when Ka-Kui is greeted by Chu Tao and his bespectacled right-hand man John Ko. It seems Chu Tao is terminally ill with only three months left to live, so he has been released from prison, and while he is still alive he vows to make life difficult for Ka-Kui. John Ko and some henchmen show up at Ka-Kui's apartment and intimidate him, baiting the policeman to attack. Later, May and her aunt are beaten by John Ko and his men. Ka-Kui can no longer hold back, and he lashes out against John Ko and his men at a restaurant. Ashamed of his behavior, Ka-Kui resigns from the Royal Hong Kong Police Force. He plans to take a trip to Bali with May, but while he is at a travel agency in a shopping mall, some police officers see him and report that the mall is under a bomb threat. Unable to resist the urge to get involved in police work, Ka-Kui tells the officers to sound the fire alarm and have the mall cleared, and agrees to take responsibility for the decision. A bomb does indeed explode, and the entire mall is leveled by the blast. Ka-Kui is praised for his efforts, and he is reinstated and assigned to solve the case of the bombing. Ka-Kui plants a covert listening device in the mall property company's office to try to learn more about the bombers. This leads to a suspect who is a deaf-mute and is a fierce martial artist and explosives expert. The bombing gang, aware that the police are on to them, plan a simultaneous bombing of the property company and the police headquarters. They double their ransom demand to $20 million and kidnap May, luring Ka-Kui into a trap in which he is strapped with an explosive vest and forced to pick up the extortion money from the property company. However, after picking up the money, Ka-Kui tells the gang that they are being followed and split up. Ka-kui, still holding the ransom, is able to drive his car into a tunnel so that the bomb he is wearing cannot be activated and he strips it off. He then goes to rescue May, who is being held in a warehouse full of fireworks. Ka-Kui again faces the deaf-mute man, who throws small firebombs at him. Ka-Kui then gains the upper hand and brutally retaliates against the mute man, finally throwing him off a third story catwalk onto a pile of plastic drums below. Ka-Kui then rescues May and departs the warehouse, just as it explodes in a huge ball of fire. Police Story 2 was released in Hong Kong on 20 August 1988 and grossed HK $34,151,609. 4K restorations of Police Story 2 and its predecessor will receive a limited North American theatrical release from Janus Films beginning on 1 February 2019. The Hong Kong version is 101 minutes long, while the Japanese release is 122 minutes long. The IVL Police Story Trilogy DVD boxed set version is the Japanese cut with Hong Kong blooper footage. Hong Kong-based company Kam & Ronsom Enterprise released the first three Police Story films on Blu-ray Disc in June 2009. New Line Cinema acquired the rights from Golden Harvest to distribute Police Story 2 on VHS & Laserdisc on 15 June 1999, with two minutes of footage cut from the original 100 minute Hong Kong version and a recycled soundtrack score from J. Peter Robinson. In 2007, Dragon Dynasty released the Japanese cut on DVD. Shout! Factory released Police Story and Police Story 2 as a double feature on DVD and Blu-ray Disc on 16 April 2013. The Criterion Collection announced that they will be releasing both Police Story and its sequel on Blu-ray on April 30, 2019. Unlike Shout! Factory's Blu-ray release, Criterion's release will have 4K Restoration on both of the films, as well as the Hong Kong-release version of Police Story 2. It also includes bonus features on Jackie Chan himself, such as new programs on his screen persona and action-filmmaking techniques, a stunt reel, and archival interviews with him and stuntman Benny Lai, as well as a 1964 TV program about Peking-opera training that was akin to the education Chan received as a child. The film received a rating of 86% on review aggregator Rotten Tomatoes. Marc Savlov of The Austin Chronicle rated it 3/5 stars and called it "a fine introduction to the Jackie Chan phenomenon" that is less emotionally charged than the first film and less outlandish than the sequel. TV Guide rated it 4/5 stars and wrote that the film makes up for its lack of story and eye-opening stunts with better pacing and more action. They concluded that this film "remains among Chan's best". In a review of the Shout! Factory double-bill, Calum Marsh of Slant Magazine rated it 3.5/5 stats and wrote, "This isn't so much exemplary filmmaking as it is bravura stunt work, but Police Story is a veritable case study in the value of the latter." On reviewing the Police Story series, Kim Newman wrote in Sight & Sound that "a rare instance of a sequel that takes criticism of the original into account, but not to the benefit of the series" as Chan "actually does tone down the destruction, making for an oddly action-light action movie with the amiable Chan out of his depth as the story tries to turn serious." In 2014, Time Out polled several film critics, directors, actors and stunt actors to list their top action films. Police Story 2 was listed at 61st place on this list. ^ Raup, Jordan (3 January 2019). "Jackie Chan's Action Masterpieces 'Police Story' & 'Police Story 2' Get New Trailer for Theatrical Restorations". The Film Stage. The Film Stage. Retrieved 6 January 2019. ^ "Shout! Factory Bringing in Jackie Chan Classics to Blu-ray; Bruce Lee Classics to DVD". Daily Grindhouse. 30 January 2013. Retrieved 2 April 2014. ^ "Criterion Announces April Titles". Blu-ray.com. 15 January 2019. Retrieved 16 January 2019. ^ Savlov, Marc (17 September 1993). "Police Story II". The Austin Chronicle. Retrieved 1 May 2015. ^ "Police Story 2". TV Guide. Retrieved 1 May 2015. ^ Marsh, Calum (16 April 2013). "Jackie Chan Double Feature: Police Story | Police Story 2". Slant Magazine. Retrieved 1 May 2015. ^ Newman, Kim (October 2011). "The Police Story series". Sight and Sound. London: British Film Institute. 21 (10): 87–88. ISSN 0037-4806.